It has rallied over 16% since the weekly cycle low in December. Because of the strength of the rally, it has changed the nature of the December low. The December low will later on be proved to be a major low. Since we have to treat the December low as a major low, the current rally will run at least another 6-8 weeks, if not longer. Right now it is 9 days into the 2nd daily cycle that started on 01/28/2019. 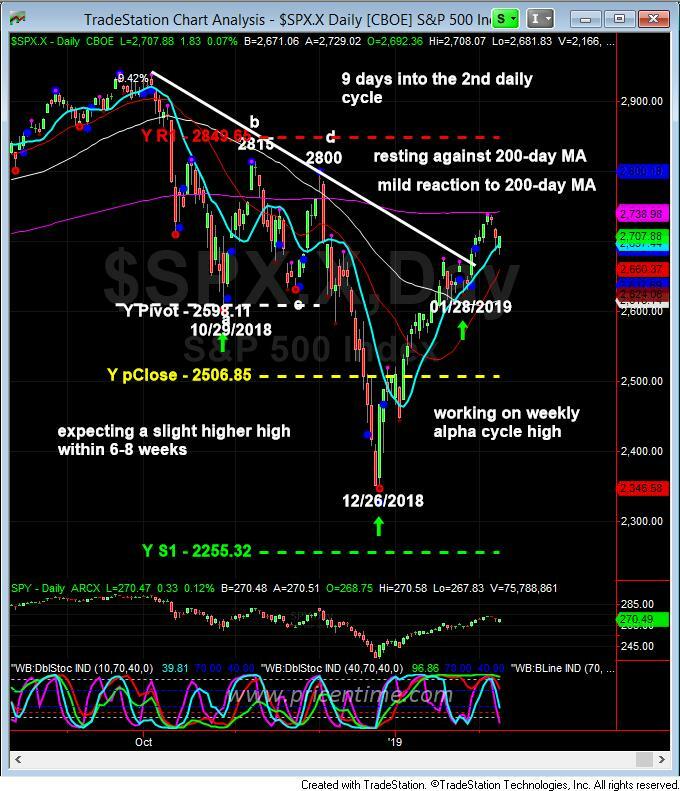 Clearly it is in the process of making a weekly alpha cycle low, this may take 2-3 weeks while the market is sideways trading against the 200-moving average. The present logical support level is the 50-day moving average, which is 2616. So watch for the 50-day moving average, which will prove to be a good entry point for the continuation of the weekly cycle. The bonds are rallying with the stock market. The bond market is believing that the economy is slowing and risk is abound, but the stock market is defying the point of view of the bonds, persistently marching up. The only reasonable explanation is liquidity. The investors are flush with money, there is no shortage of money that will chase the market even though the slower earnings growth is reported abundantly. Again, we reaffirm our long term bullish view. This is a base building phase, the market will kick in gear in the 2nd half of the year. This entry was posted	on Sunday, February 10th, 2019 at 6:30 pm	and is filed under Forecasts, Stock Indices. You can follow any responses to this entry through the RSS 2.0 feed. Both comments and pings are currently closed.